This Roulette Wheel Glossary is divided into 3 parts at gamerisms. Roulette is one of the most recognized casino games and is played enthusiastically worldwide. The first part or introduction includes a table layout graphic, a listing of all bets/payouts and roulette wheel strategies that are followed by terms in 2 parts. There are several French roulette terms, mais oui—but of course! Roulette single-zero tables offers a low casino edge of 2.63%. Double zero Roulette has a 5.26% house or casino advantage. European Roulette: Single zero is positioned between black 26 and red 32. Another plus of the European game is en prison rule on even-money bets. When zero comes up, your bet remains or is 'captured' for the next spin. En-prison or surrender rules on even money bets reduces the casino edge further to 1.35%. The 0, 00, 1, 2, and 3: five-number bet has a large 7.89% casino advantage. Avoid this bet. 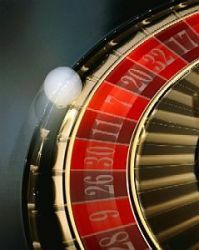 Action: The game of Roulette consists of the following bets/payouts. J. 5 Numbers: 0, 00, 1, 2 & 3.=6 to 1 Yikes, the worst bet on the table! Roulette Wheel Glossary betting layout displays the numbers 0 and 00 at the top, followed by the numbers 1 through 36 at the far end of the table. This area is known as the ‘inside’ betting area where the following bets are placed—Straight Up, Split, Row, Corner, 5 Numbers and Double Row. The following bets are placed at the ‘outside’ betting area—Column, Dozen, Red or Black, Odd or Even and 1-18 or 19-36. American Wheel: has 38 numbers, 0 and 00 plus numbers 1-36. The number sequence is as follows, clockwise beginning with 0: 0, 28, 9, 26, 30, 11, 7, 20, 32, 17, 5, 22, 34, 15, 3, 24, 36, 13, 1, 00, 27, 10, 25, 29, 12, 8, 19, 31, 18, 6, 21, 33, 16, 4, 23, 35, 14, 2. Here are 3 strategy plans to increase your bankroll and enjoyment of the game. Roulette Strategy #1: Place red or black bet with corresponding column bets to cover 26 numbers: Black bet covers all 18 black numbers. Also, bet Column 3 under #36 for eight (most) red numbers. Red bet covers all 18 red numbers. Also, bet Column 2 under #35 for eight (most) black numbers. Roulette Strategy #2: Dozen/Column Betting: Place four bets, 2 Dozen, and 2 Column, and then you will have covered all numbers except 4 inside and double/single zeros. Therefore, 32 numbers with some numbers twice. All wins pay 2-1. Roulette Strategy #3: Start with 40 chips: $1 denomination is the least expensive way to go. With most tables requiring $5 minimum inside bets, you qualify by placing 5 inside straight up bets. Use the same 5 numbers for a series of 8 spins totaling your buy-in of 40 chips. Chose your lucky numbers based on favorite numbers/dates placed in the middle of that number each time. Any win, pays 35-1, and two wins after 8 spins brings in a profit. A. Decrease the house edge. B. Increase the house edge. C. No difference on the house edge. 1) C. No difference on the house edge. The house edge applies to 0 and 00 just as it does to any other bet on the wheel.